Sandals unprecedented resort Butler Service, trained by The Guild of Professional English Butlers, and only available in the very highest level of suites, provides guests with an unimaginably supreme standard of service and luxury, where your every need is anticipated and also includes Club Sandals Concierge. offers additional arrival & personalized staff services, concierge lounge amenities, and other additional inclusions. Enjoy complimentary bar in your room restocked daily, complimentary Wi-Fi, and room service 7:30am-10pm (except Sandals Halcyon). The original Sandals resort which, opened in 1981, Sandals Montego Bay located in Jamaica is known as the most active of the Sandals resorts, marketed by Sandals as the resort “where the fun never stops”. During the day, a fun beach resort all led by a friendly outgoing staff. At night, an entertaining social gathering centered on the beachfront main building which is an open air roofed structure that includes several restaurants, bars, and the amphitheater/dance complex. The resort’s nightly high energy atmosphere draws in guests from the Sandals Royal Caribbean resort and Sandals Carlyle utilizing the Sandals exchange privileges and complimentary scheduled shuttle transfers between the three resorts. 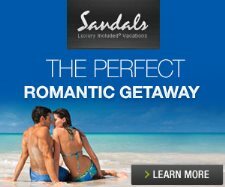 Sandals Montego Bay has a very loyal following and is among the highest return guest rate among the Sandals Resorts. Location - Northeast Montego Bay Jamaica bordering Montego Bay's Sangster International Airport. Approx 5 minute shuttle drive from the airport. Approx 10 minutes from Sandals Carlyle in downtown Montego Bay area and 10 minutes west of Sandals Royal Caribbean. Atmosphere - Very active and energetic, alive at night with a celebration atmosphere all centered around the Sky Dome and Bayside terrace area. Most lively of all the Sandals resorts. Bordering the airport, guests do hear and see airplanes taking off and landing sporadically from morning into the evening hours. Layout & Design - 250 rooms & suites within fairly thin beachfront property stretching along the long beach stretch, flat and easy to get around. Several 3-story accommodation buildings located within gardens & grounds and villas on the eastern quieter side of the resort. Although the resort is fully renovated to Sandals luxury standards, some of the foundation infrastructure dates back to the 60's featuring Caribbean open-air lobby area, external hallways, and large balconies. Sandals Montego Bay features 8 restaurants. Room Service included for Butler Service suites (24-hour) and Club Level rooms (7am-10pm). Water dining lunch offered for butler guests, reservations required. Bayside Restaurant (International) Sample Menu - primary restaurant serving breakfast, lunch, and dinner overlooking the beach. Enjoy buffet breakfast and lunch. Dinner features French a la carte cuisine. Indoor & outdoor seating available. No reservations, resort casual attire, non-smoking. Breakfast 7:30-11am, continental 5-7:30am. Lunch 12:30-2:30pm. Dinner 6-9:30pm. Oleander Room (Jamaican) Sample Menu - White-glove service Jamaican cuisine within air-conditioned setting overlooking the ocean. No reservations, non-smoking, Dinner 6-9pm. Cucina Romana (Italian) Sample Menu - Under the roof open-air lively atmosphere overlooking the sea serving popular Italian dishes. Resort casual attire, non-smoking, dinner reservations required. Serves breakfast 8:30-11am Monday, Wednesday, Saturday. Dinner 6-9pm. Tokyo Jo's (Stir Fry) - Interior open-air setting constructed over the water, stir fried dishes prepared in open kitchen. Resort casual, non-smoking, reservations required, dinner 6-9pm. Stewfish (Seafood) Sample Menu - Casual setting directly on the sand serving Jamaican and Caribbean seafood. Resort casual with barefoot permitted, non-smoking, no reservations, dinner 6-9pm. Cricketer's Pint (English Pub) Sample Menu - Indoor traditional English pub serving pub favorites. No reservations, resort casual attire, non-smoking. Serves dinner daily 4-10pm, late night snacks until 5am, bar is open to 3am. Dino's Pizzeria (Pizza) - Casual outdoor setting with made to order brick oven pizza including homemade sauce and toppings, 11am-6pm. Mariner Seaside Bar & Grill (Beach Grill) Sample Menu - Beach grill offering Jamaican specialties and lunch favorites. Casual outdoor setting, 11am-4pm. Known as the most active and entertaining Sandals Montego Bay features four pools, the original hotel pool, a newer pool which also includes a swim-up bar, a small pool in front of cottage 7, and the spa pool. 4 whirlpools are located around the property. All of the pools are smaller in size as the resort is known much more for having the largest private beach among the Jamaica north coast resorts. Scuba dive & snorkeling boats, glass bottom boat, and full range of water sports. Resort scuba certification & PADI International Dive certification available at additional cost. Air conditioned fitness Center, Red Lane Spa (additional cost), 4 day/night tennis courts, and other land activities available such as beach volleyball, pool tables, and basketball. Sandals activity & entertainment staff lead full schedule of activities throughout the day and night (sample activity schedule page 1 | page 2). Full schedule of nightly theme parties throughout the week. Nightly entertainment focuses around the sky dome amphitheater which is located in the open air open lobby area surrounded by the main bar and restaurants. Rooms are primarily located within three 3-story buildings - Almonds, Palm, and Seagrapes blocks. Exception is the entry level Deluxe category which is located 2nd floor of the Oleander building above the restaurants. The suites are all located in the exceptional Honeymoon Estate Butler Village villas. All rooms with TV, refrigerator, and Sandals standard room inclusions. Butler and Club Sandals concierge categories include complimentary in-room bar and Wi-Fi. Previously known as the Bay Roc Villas, this section comprises a series of villa units located along the beach on the quieter eastern portion of the resort. Most of the villas are located near beach edge. Pricing is among the least expensive oceanview, concierge, and butler accommodations available among the Sandals brand. (LS) Caribbean Luxury - garden view with patio - located 1st floor villa 8 & 19. Note this is not a suite category and does not have butler, concierge, or room service. Most of the (LS) category rooms are located within the Caribbean Village Seagrapes Building 2nd floor. Section contains the 3-story Almonds building which faces non-beach stretch of the ocean. All rooms with ocean views, whirlpool tub, and club level concierge service. No elevator. (WP) Oceanfront Honeymoon Club Level Veranda Room - 3rd floor with larger extended balcony and best views. (HW) Oceanfront Honeymoon Club Level Room - similar in style and decor as (WP), but no double vanity. 2nd floor with balcony. (HWW) Oceanfront Honeymoon Walkout Club Level Room - same as HW but first floor with walkout patio to the grounds. Contains the 3-story Palms building which contains the closest units to the beach among the three primary buildings. Building reconstructed, now all luxury suites including one bedroom butler suites and concierge junior suites. No elevator. (OWT) Beachfront Honeymoon Walkout One Bedroom Butler Suite w/Tranquility Soaking Tub - beachfront with walkout spacious patio to the grounds. Private tranquility soaking tub for two. Lavish furnishings and spa-like bathroom. Butler, concierge, and 24-hour room service. 1st floor. (OBT) Beachfront One Bedroom Butler Suite w/Tranquility Soaking Tub - same as (OWT) but located on 2nd & 3rd floors. (WGBT) Beachfront Honeymoon Walkout Club Level Junior Suite w/Tranquility Soaking Tub - very similar to (OWT) and (OBT) in styling but a smaller sized junior suite with no separate bedroom. Club level concierge service and room service. 1st floor. (GBT) Beachfront Grande Luxe Club Level Junior Suite w/Tranquility Soaking Tub - same as (WGBT) but located 2nd & 3rd floors. Contains the 3-story Seagrapes building which is set back in the resort's garden area. All rooms with balcony or patio, shower/tub combination. No elevator. (LW) Caribbean Luxury Walkout Room - 1st floor with garden view and patio with walkout ability to the grounds. Handicap accessible. (LX) Caribbean Oceanview Luxury - ocean view - 2nd & 3rd floors with balcony. (LS) Caribbean Luxury - garden view - 2nd floor with balcony. Some units also located Honeymoon Estate Villas 1st floor cottage 8 & 19. This is the primary resort building which contains the lobby area, many of the restaurants, and the amphitheater complex. No elevator. (DL) Caribbean Deluxe - overlooks main pool area - no balcony or patio - walk-in shower - 2nd floor Oleander building above restaurants. 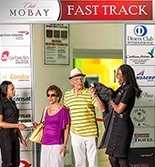 Montego Bay Jamaica: All flights go through the Montego Bay airport (MBJ). The Sandals Resorts in Montego Bay (Montego Bay, Royal Caribbean, and Carlyle Inn) are within minutes of the airport. The resorts have full exchange privileges with each other and Sandals provides complimentary scheduled shuttles. Popular excursions include deep sea fishing, canopy zip line, dolphin cove and more.